Penguin delivers you to the front lines of The Pacific Theater with the real-life stories behind the HBO miniseries.Between America's retreat from China in late November 1941 and the moment General MacArthur's airplane touched down on the Japanese mainland in August of 1945, five men connected by happenstance fought the key battles of the war against Japan. From the debacle in Bataan, to the miracle at Midway and the relentless vortex of Guadalcanal, their solemn oaths to their country later led one to the Great Marianas Turkey Shoot and the others to the coral strongholds of Peleliu, the black terraces of Iwo Jima and the killing fields of Okinawa, until at last the survivors enjoyed a triumphant, yet uneasy, return home. In The Pacific, Hugh Ambrose focuses on the real-life stories of the five men who put their lives on the line for our country. 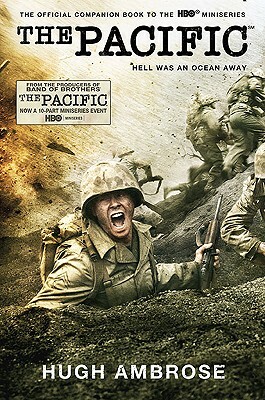 To deepen the story revealed in the miniseries and go beyond it, the book dares to chart a great ocean of enmity known as The Pacific and the brave men who fought. Some considered war a profession, others enlisted as citizen soldiers. Each man served in a different part of the war, but their respective duties required every ounce of their courage and their strength to defeat an enemy who preferred suicide to surrender. The medals for valor which were pinned on three of them came at a shocking price-a price paid in full by all. Hugh Ambrose is a noted historian and was a consultant on the documentary Price for Peace, for which Steven Spielberg and Stephen Ambrose were the Executive Producers. He was a consultant to his father on his books, and is also serving as a historical consultant on HBO(r) s The Pacific miniseries. Ambrose is also the former vice president of the national World War II Museum and has led battlefield tours through Europe and along the Pacific Rim. He lives in Helena, Montana."